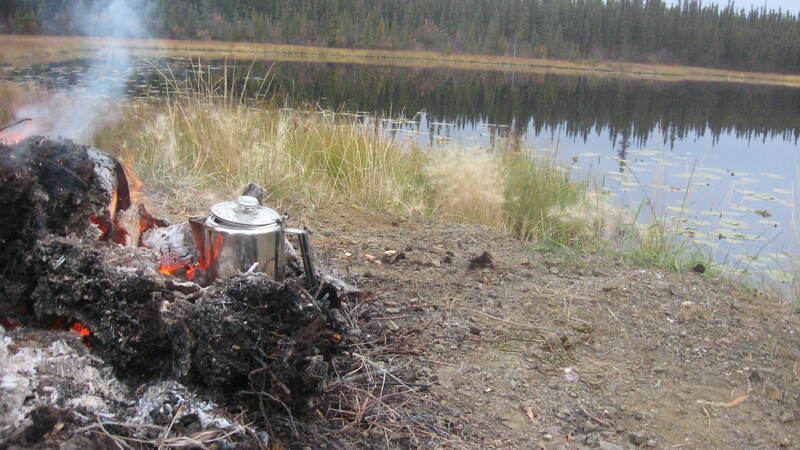 Moose, caribou and bears….beware….well not really. So the girls (me, Amy and Amy’s mom Carrie) planned a hunting trip. We had tags for caribou, moose and bears. Unfortunately the animals knew about it and went into hiding. We felt somewhat better when we ran into hunters who were having the same trouble. 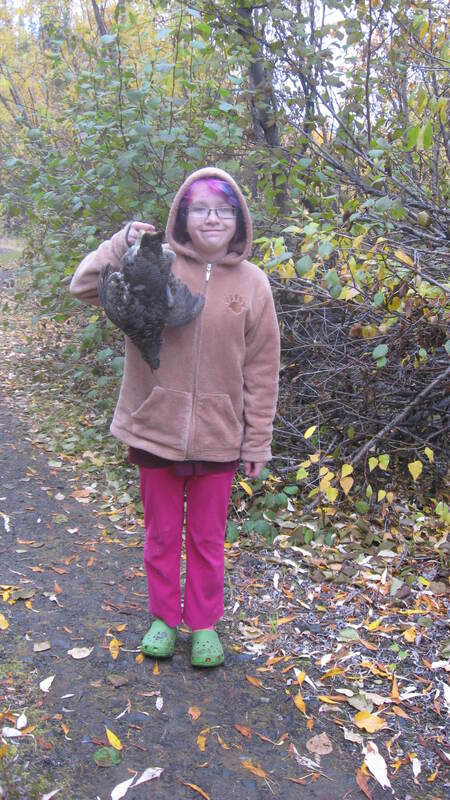 However there was one spruce grouse who took one for the team and became lunch on Saturday. I love Alaska! Shoot a grouse in the morning and a few hours later cook it up over an open fire. Life really doesn’t get any better than that! Camping was awesome! Friday night was chilly and saw a bit of snow. Poor Carrie was up at 2 a.m. and slamming the truck door at 5 o’clock. She chose the door method of waking people up because she was under strict instructions not to wake Amy or I up. Have I mentioned I love that kid? Saturday night was much warmer. We slept in a pullout area beside these trails which were littered with bear and wolf tracks. Amy and Carrie slept in the truck. I snoozed in the tent with a pistol at the ready. Good thing Amy’s snoring kept the animals away….hee, hee, hee. We did watch a black bear cub in a serious search for a vole – under the supervision of his mama. It was really fun to watch him grass surf and jump up occasionally. Mom would stand up every once in a while to catch our scent. She knew we were there but were far enough away she had no worries. 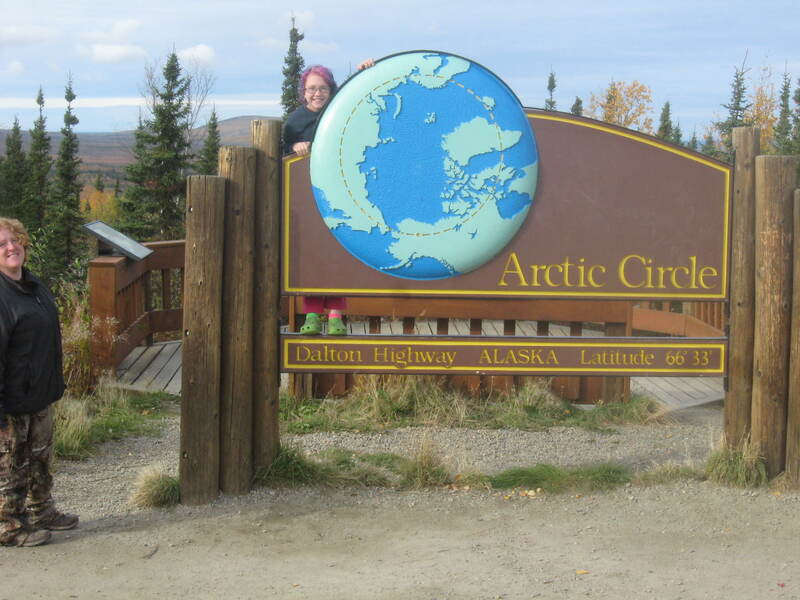 Amy talked to the truckers as we drove up the Dalton Highway. Yup, that’s the one on Ice Road Truckers. Contrary to what Discovery would have you think, death did not await us at every corner. Most truckers were happy so speak with the Purple Dinosaur – the handle we gave Amy because of her awesomely colored hair. We had a heater issue at the Yukon River but some other hunters helped us to figure out it was a loose connection on the blower motor. Hopefully they had a good hunt. All in all it was a load of fun and even though we were pretty much skunked, I’d do it again in a heartbeat! Enjoy the pictures. 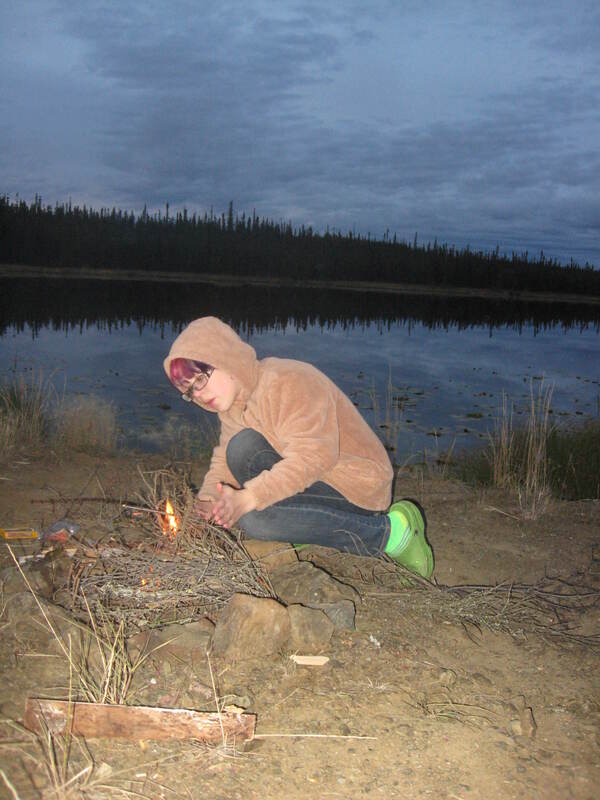 Amy was mostly in charge of making fires. She is really skilled at it. Coffee!! I admit I need it in the morning! 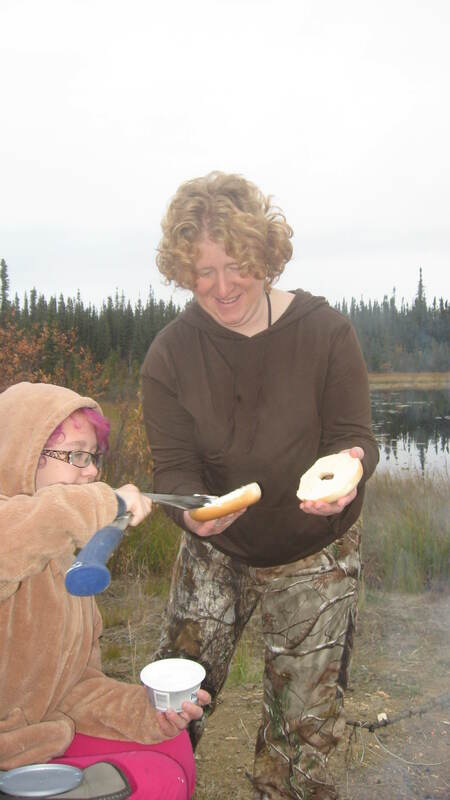 Carrie and Amy spreading cream cheese on my bagel. Who needs a knife when you have an axe! Carrie is queen of the bungee cord! 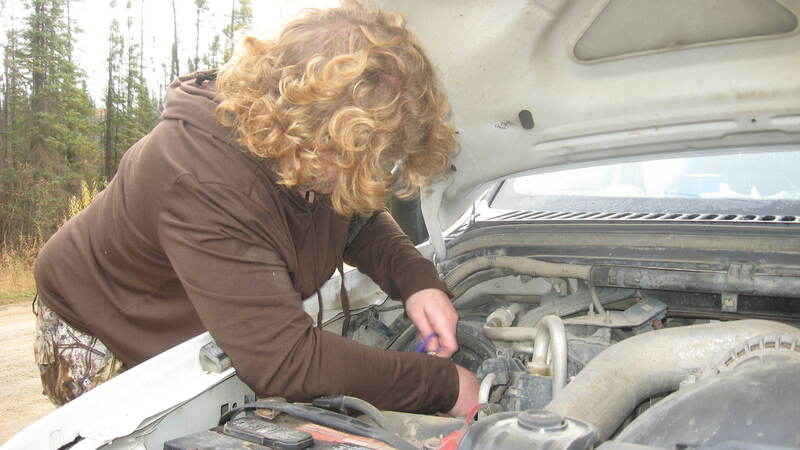 Who needs a mechanic? 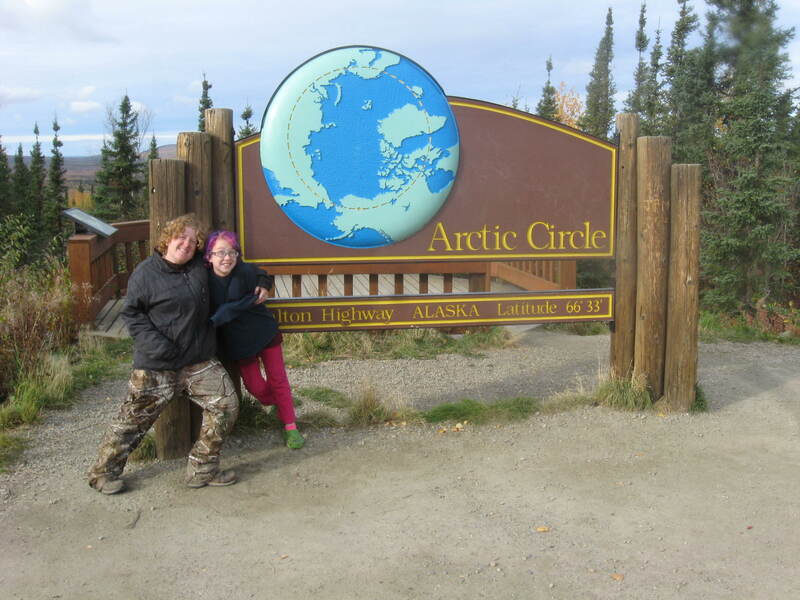 Carrie and Amy at the official Arctic Circle!